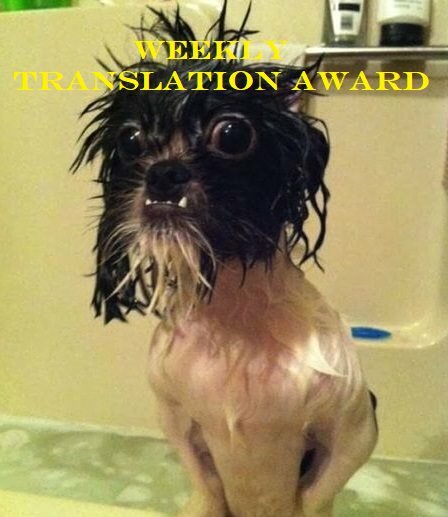 The Wet Dog Award for Translation of the Week goes to....(drumroll)..... CLADKING. The judges were seriously impressed with the following translation from the Pyramid Texts. I don't know what a "sik" is but it's something that can be had by a geyser and offered to it. Lovely that he bought a geyser into play. It's been a while. Of course, some may be scratching their heads wondering just how a geyser can have a sik, but obviously geysers can do more than just spout water. Don't stop scratching until you've also pondered on just how and why one would wish to offer a sik to a geyser. Must be some sort of religious observance (a mystery known only to YKW) so that the geyser spouted on time to make those two ton swallows fly in formation, eight at a time, over 80 feet up the pyramid. And for his efforts Cladking is privileged to receive "The Wet Dog Award" as a nice memento of his love of geysers and dogs.